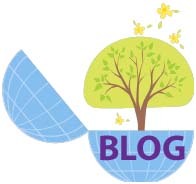 Second anniversary of my blog – sharing and learning in community with other genies around the world. Today is my second anniversary of blog-writing. It’s been a fascinating journey and one which has taken me on a different path from what I originally anticipated. 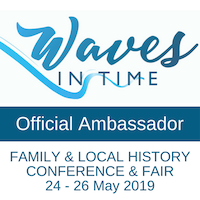 When I began I wanted to share information on “my” Dorfprozelten immigrants, try to attract anyone with Broadford or East Clare ancestry and share some of my family history research and a little bit about living in the Top End of Australia. 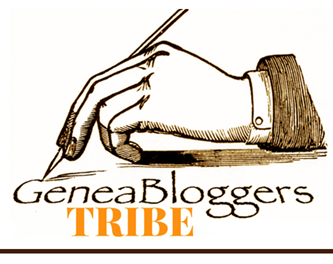 I was totally naive about genealogy blogging and didn’t even know Geneabloggers existed or how many genealogy bloggers were out there sharing their research, skills and knowledge. My first year was a “toe in the water” year as I was still working full-time, unsure about my posts, and not devoting much time to the blog. After finishing work this time last year I ramped up my blog presence and thanks to people like Geneabloggers came to realise just how many fascinating blogs were being written. Tips from other bloggers like Geniaus and then RootsTech 2011 also expanded my techno skills in this area. In those early days, comments from fellow bloggers like Carole Riley inspired me to keep writing and let me know I wasn’t writing into a vacuum. My most popular single post has been my Dorfprozelten page about the immigrants from that small village on the River Main in Bavaria, Germany. It’s been a great meeting place for people with ancestors from there, and there’ve been wonderful times when I’ve felt a bit like a match-maker connecting linked families. A big bonus! I’m considering splitting this theme off into a separate blog in 2012 and adding more of my research. I’d love to have heard more from people with ancestors from anywhere in East Clare (from the Limerick/Tipperary border across to Ennis) and especially Broadford, but this hasn’t been as productive as the Dorfprozelten page. This year I’ve participated in the series designed by Amy Coffin, 52 Weeks of Personal Genealogy and History as well as the Geneabloggers Advent Calendar of Memories. The topics have made me dredge my memory for things that have been mentally filed away for years, so it’s been a great opportunity to revisit them and document the history. 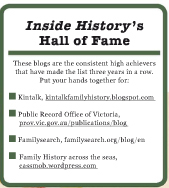 My main motivation for posting on these topics has been to leave my own history for my children and descendants so I will be combining these posts into book form (Olive Tree Genealogy has some tips here). It’s also been great fun to do some of the geneamemes that have come through…inspires me to think about what I might do differently, what skills to add to my repertoire and consider which things I want to include vs which I don’t. I also had a crack at a geneameme myself, Beyond the Internet, with the goal of highlighting just how much genealogy information is still off-line and what can be found there. A while ago I posted on Open Thread Thursday about The Benefits of Blog reading and Why I blog, based on my experiences over the past two years. It’s been a great journey and I’ve gained so much from being part of the online genealogy community – even more valuable to me as I live away from many of the resources and learning opportunities others take for granted. To all my followers and occasional readers, a HUGE thank you! You have become my online community and it’s your visits and especially your comments that make blogging so interesting and keep up my enthusiasm levels. I look forward to “speaking” with you again in 2012.